Chipping can often be a difficult lesson for our coaches to teach beginner students because it’s not as fun as swinging the club as hard as you can (like driving) and there’s rarely immediate satisfaction by the result (like putting). It also has the potential to be extremely frustrating. Well, TGA Beach Cities uses two key teaching cues to try and minimize resistance from our beginner students: Tick Tock and Sweep the Floor. 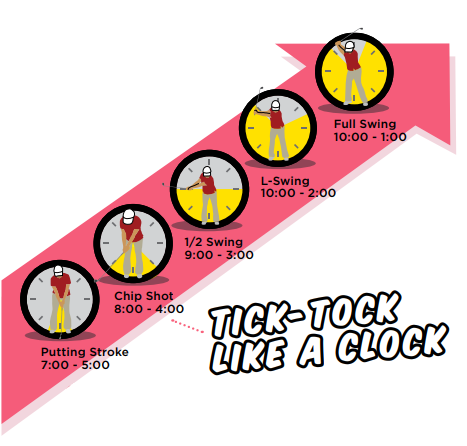 For Tick Tock, we ask our students to think of a pendulum on a clock for rhythm and distance. Sweep the Floor is just as simple. Our coaches have students pretend to use a broom and sweep the floor to keep the club head low to the ground. Despite the push back from most students when they learn they can’t take a full swing, Chip Tic Tac Toe is one of the most popular station activities during enrichment class and summer camp. It’s played just like tic tac toe, except students must chip the balls to earn X’s or O’s for his or her team. Plus, students of all levels can enjoy indoors or outside and with or without clubs when we combine the game with another favorite, toss golf. Ski Ball can also be an effective game to teach kids how to get the ball airborne. Relating golf games to common, popular kids games are a big reason why kids enjoy TGA programs so much! Learn about G.A.S.P. and other golf skills at a TGA program near you.